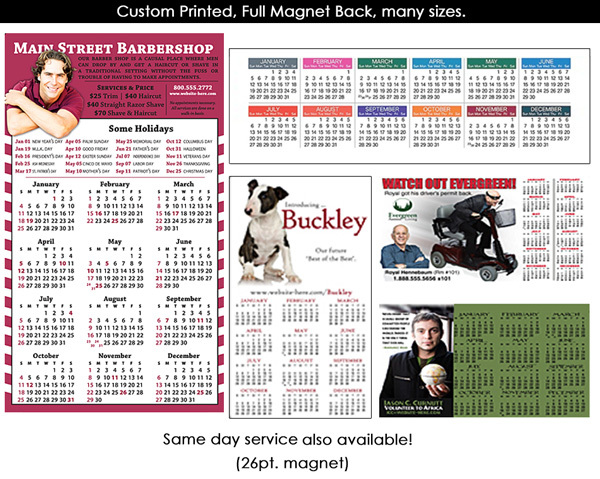 Magnet Calendar Printing Toronto Mississauga Brampton Oakville | Print Den Inc.
Make your business stay in front of your customers' minds throughout the year! Our custom calendar magnets are a perfect example of marketing gone right. Your clients will love to have these calendars every year as much as you. They always meet your expectations- the product is as described. At Print Den, we accommodate beginners and experts with a design and product that your clients will just adore. Not only do we assist you in making the personalized design, but we also ensure year around marketing, to say the least. Not only do we offer one of the best quality magnetic calendars in Canada, but we also do so passionately to ensure they make a professional impression which is everlasting with it's unmistakable for the vivid colour reproduction that we offer, coupled with tack sharp prints and versatile designs. These are sure to suit your personal and business needs alike. There is a myriad of options available as sizes to fit your marketing needs and they come with a glossy finish on 17pt and also on26pt premium quality stock, for blazing fast turnaround times.